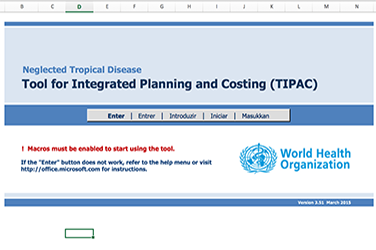 As we move closer to global targets, strong national health systems will be critical to ensure progress towards NTD control and elimination not only accelerates but is sustainable – recognizing that these targets can only be met with health systems that can successfully prevent, detect, and treat NTDs. 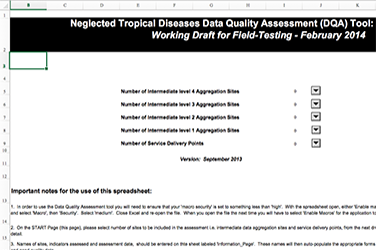 USAID’S ENVISION project provides technical assistance to national NTD programs working towards 2020 targets for NTD control and elimination, as outlined in the WHO Roadmap for Implementation. To support national NTD programs in achieving these ambitious targets, ENVISION uses a health systems approach. Through a health systems strengthening (HSS) lens, we see how the global NTD community is strengthening institutions and catalyzing lasting transformations in health systems to achieve impact through the decreased burden of NTDs. 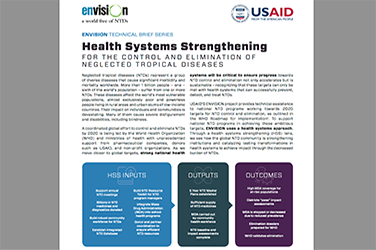 In this latest addition to the ENVISION Technical Brief Series, ENVISION analyzes a health systems approach to NTD programming and assesses the Project's contributions to each of the WHO HSS building blocks.